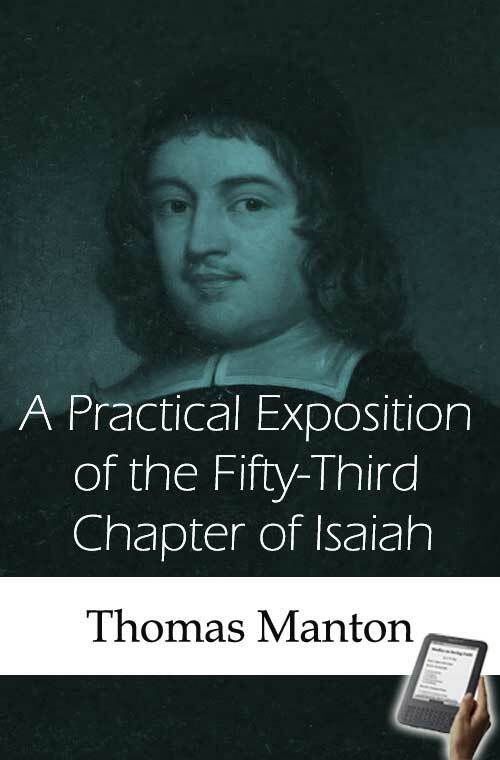 THE character of Dr Manton is so generally known by his celebrated preaching so many years in this city, and by the numerous collections of excellent discourses published since his death, that I cannot think it needful to give any account of him here, as I do not pretend to add anything to the accounts already given by those excellent persons that published his former works. It will be sufficient to remark, that his works have been esteemed by some of the best judges one of the most valuable collections of scriptural and practical divinity, and to have been as generally serviceable to the world as most that have appeared in these latter ages, and in many respects no way inferior to some of the ancient monuments of the Christian church. 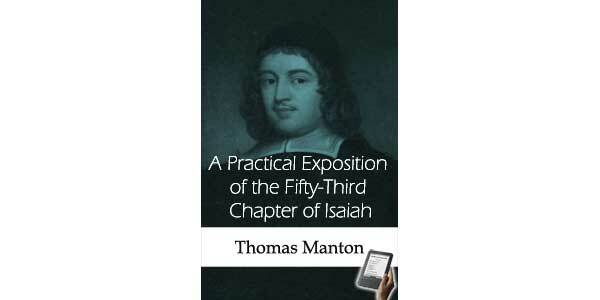 I shall reckon myself concerned only to give some account of this treatise. As to the subject of it, I shall only observe, that as the prophecy of Isaiah contains the clearest revelations of the Messiah, and is writ in the loftiest style of any part of the Old Testament, so this excellent chapter is an eminent instance of both, containing an exact description both of his sufferings and his glories, represented in bright and lively colours, and in a phrase, though somewhat difficult and obscure, exceeding lofty and sublime. The veil of the temple seemed to have been drawn aside, though not yet rent asunder, and the light of the gospel shone forth with a brighter glory than ever it had appeared before. Upon those accounts this chapter has exercised the thoughts and employed the diligence of several eminent persons in former and later times; though, through some or other misfortune, they have been buried with their authors, and have never seen the light. Perhaps this is the only thing that can pretend to a just discourse now extant. As to these discourses themselves, they bear the lively signatures of the excellent author, and are of a piece with the rest of his works. There is a judicious choice of pertinent matter, disposed in a regular method, expressed in a plain and native elegance, quickened and enlivened with proper images, and tinctured throughout with a deep savour of true piety. And though they may be thought neither so polished nor correct as his riper years and his last hand could easily have made them, or as were necessary to gratify the nice and the curious; yet they seem, however, excellently fitted to a better end, — to promote saving knowledge and real godliness, to move and to instruct the mind, and give entertainment as well as profit to the serious and the wise, and are particularly suitable to sacramental occasions. It will be only further necessary to acquaint the reader that, as these sermons were preached in his stated and ordinary course, so they were preached in his early youth, and are younger than any of those that have seen the light; which must be his apology to the world if any expressions are found up and down less accurate and clear, or any thing different from what was known to be his sense in some of his later writings. I have compared the transcript with the original notes, and find reason, after all the care that has been taken, to beg the reader’s candour and excuse for any smaller errors that may have escaped, both of the copy and of the press. Verse One - Who hath believed our report? and to whom is the arm of the Lord revealed? Verse Two - For he shall grow up before him as a tender plant, and as a root out of a dry ground: he hath no form nor comeliness: and when we shall see him, there is no beauty that we should desire him. Verse Three - He is despised and rejected of men; a man of sorrows, and acquainted with grief; and we hid as it were our faces from him: he was despised, and we esteemed him not. Verse Four - Surely he hath borne our griefs, and carried our sorrows; yet we did esteem him stricken, smitten of God, and afflicted. Verse Five - He was wounded for our transgressions, he was bruised for our iniquities: the chastisement of our peace was upon him; and by his stripes we are healed. Verse Six - All we, like sheep, have gone astray; we have turned every one to his own way; and the Lord hath laid upon him the iniquities of us all. Verse Seven - He was oppressed, and he was afflicted; yet he opened not his mouth he is brought as a lamb to the slaughter, and as a sheep before her shearers is dumb, so he opened not his mouth. Verse Eight He was taken from prison and from judgment; and who shall declare his generation? for he was cut off out of the land of the living; for the transgression of my people was he stricken. Verse Nine - And he made his grave with the wicked, and with the rich in his death; because he had done no violence, neither was any deceit in his mouth. Verse Ten Yet it pleased the Lord to bruise him; he hath put him to grief: when thou shalt make his soul an offering for sin, he shall see his seed, he shall prolong his days, and the pleasure of the Lord shall prosper in his hand. Verse Eleven He shall see of the travail of his soul, and shall be satisfied: by his knowledge shall my righteous servant justify many; for he shall bear their iniquities. Verse Twelve Therefore will I divide him a portion with the great, and he shall divide the spoil with the strong; because he hath poured out his soul unto death: and he was numbered with the transgressors; and he bare the sin of many, and made intercession for the transgressors.